Attention opponents of Common Core in Missouri: We won. You petitioned the state legislature and were successful in gaining the passage of HB 1490, a bill that established work groups to write new learning standards. Committees of Missouri parents, educators, and professors were appointed by legislators and state education organizations, convened, and have completed their task. Those new standards have been submitted to the Department of Elementary and Secondary Education for a hearing on Monday, October 26, and will be vetted by Missourians. You also were successful in getting the legislature to defund standardized tests aligned with Common Core. You engaged the political machinery through the democratic process and have successfully won the battle against Common Core. This was no small feat. Unfortunately, it seems that many Common Core critics have failed to see just how successful they’ve been. Instead of celebrating the new standards, developed by Missourians, they’ve lambasted them because of their similarity to Common Core. Rather than cheer the change of standardized tests, they continue to criticize the old. Opposition to the Common Core has led to opposition to anything that the state might have its hands in, even charter schools and school vouchers. Some have been wrapped up in anti–Common Core sentiment for so long that it is difficult to see the forest for the trees. It is time to stop fighting against Common Core and start fighting for the principle that led you into battle in the first place—parental control. Did you oppose Common Core because the standards were not rigorous enough or were not developmentally appropriate? What you’re saying is that you believe children are unique and deserve an education tailored to their needs. 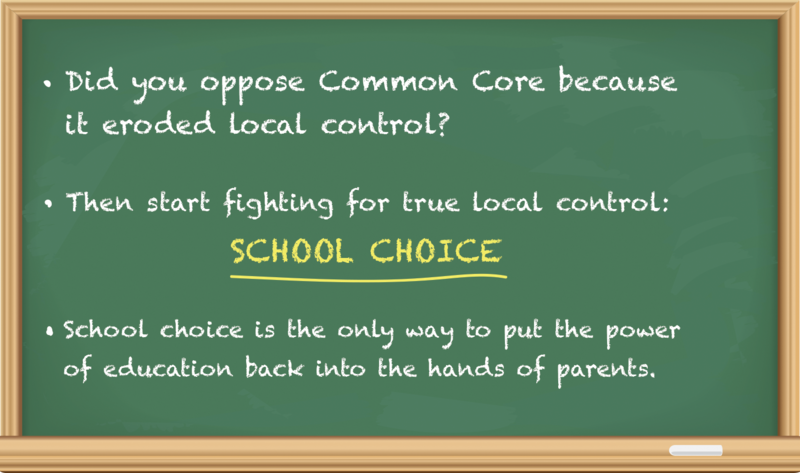 Did you oppose Common Core because it eroded local control? Then start fighting for true local control: school choice. School choice is the only way to put the power of education back into the hands of parents.